Hack #1 | HACK It! 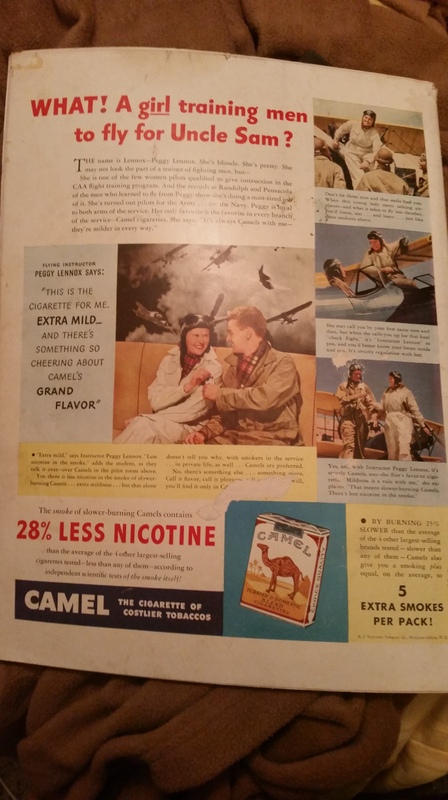 I was flipping through an old edition of Life Magazine from 1942 today when I noticed this advertisement for Camel cigarettes on the back. It tells the story of a woman, Peggy Lennox, who trained pilots for war during World War II. It reminded me of when we spoke in class about the position of women and other subjugated groups during and after World War II, and how they changed. I believe this ad shows the new national importance women gained during the war, yet it also shows the sexist ideas people still held about them. Note how the title expresses disbelief about a woman being able to do something that was traditionally thought to be a “man’s” job. In fact, later in the ad, it talks about how Peggy is able to do a “man-sized job.” While this ad was meant to show the value of women toward the war effort, it was more indicative of the sexist ideas people still held about them and that much more progress was needed in the battle for gender equality.